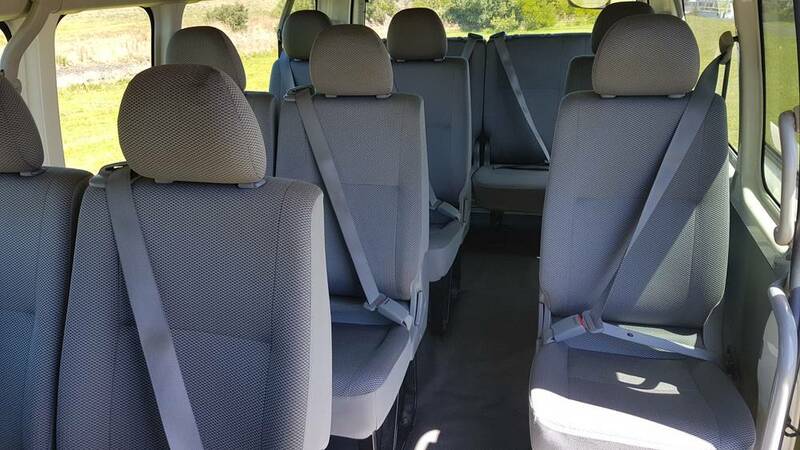 Our 12 seater is a great vehicle that is popular with small groups for hire. Only a normal car licence is needed to drive the Commuter. 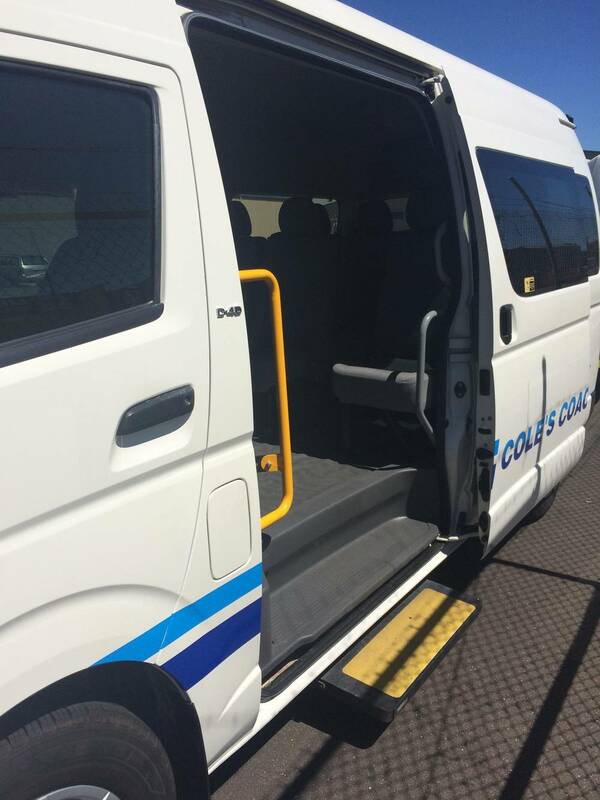 This bus is flexible and can seat up to 13 passengers should the driver have a minimum Light Rigid Licence. 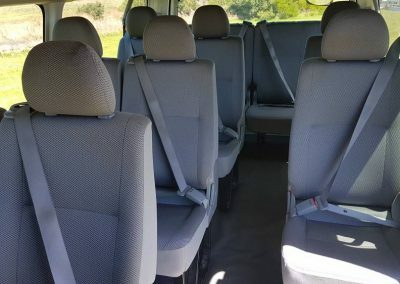 WHO CAN HIRE OUT MINI-BUSES? Anyone can hire out a mini-bus. The only pre-requisite is that the driver has the appropriate licence to drive the vehicle hired. 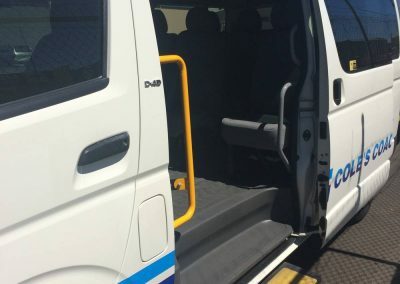 WHAT SIZES ARE THE MINI-BUSES AND HOW MANY PEOPLE CAN THEY LEGALLY CARRY? Buses may vary. Please refer to ‘Our Fleet’ page. Drivers aged 25 years and over with the appropriate licence to drive. WHAT TYPE OF LICENCE IS REQUIRED? Please refer to ‘Our Fleet’ page. CAN I HAVE MORE THAN 1 DRIVER? Yes. Any additional drivers must also supply a copy of their appropriate licence. CAN COLE’S COACHES SUPPLY A DRIVER? Yes. 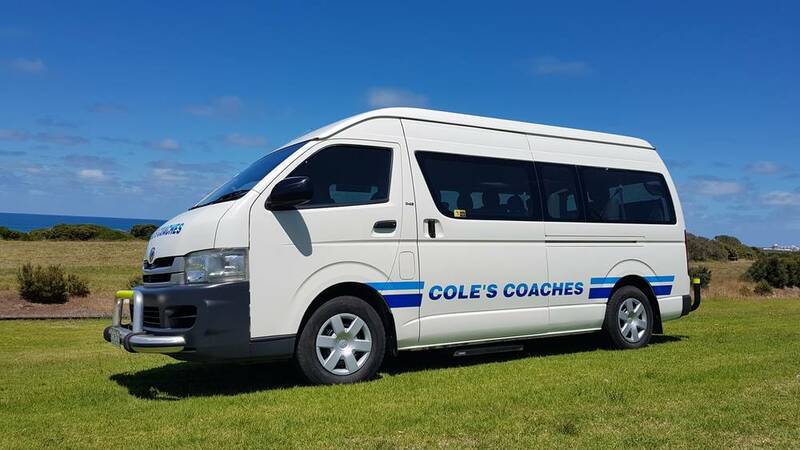 Cole’s Coaches have experienced tour drivers available. DOES THE HIRER & OR DRIVERS HAVE TO SIGN ANY FORMS? Yes. Prior to the hire date, the Self-Drive Agreement form will need to be signed and returned to Cole’s Coaches. WHO IS RESPONSIBLE FOR THE BUS? The hirer is ultimately responsible for the bus. CAN I HIRE A MINI-BUS FOR HALF THE DAY? WHAT INFORMATION NEEDS TO BE PROVIDED FOR A QUOTATION OR BOOKING? 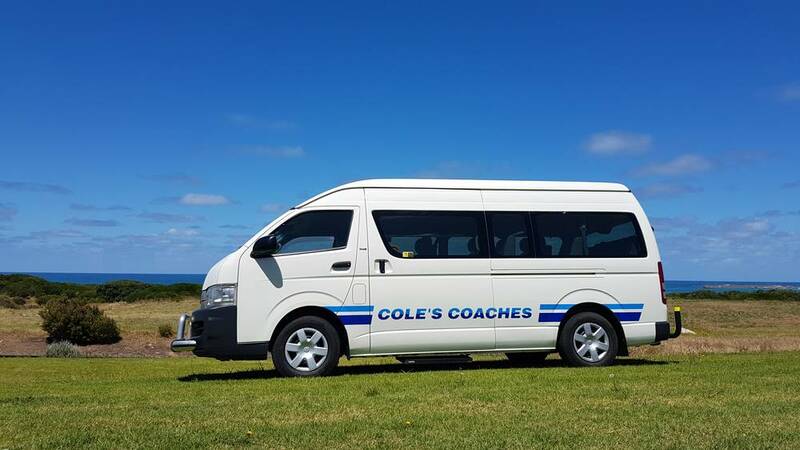 Do you require a Cole’s Coaches driver or prefer self-drive. 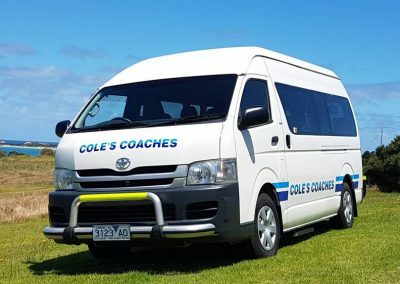 Times will need to be provided if using a Cole’s Coaches driver. HOW ARE VEHICLE COSTS CALCULATED? A kilometre rate is charged along with a daily hire fee. The fuel cost is also included in the quotation. Extras will be offered and added to the booking upon request. WHAT IF WE GO OVER THE ESTIMATED KILOMETRES ALLOCATED? If after the trip any additional kilometres or days are accrued, this will be added to the quoted price and be charged out at the normal vehicle rates. A $100 deposit may be required to secure a booking. A credit card security bond may also be needed. If the booking is cancelled less than 7 days prior to the date hire, a cancellation fee of $100 may apply. WHERE DO I COLLECT THE VEHICLE FROM? Vehicles are at Cole’s Coaches depots. Please speak to our friendly reception staff for instructions. Free parking is available for the driver on site. IS THERE SOMEONE THERE WHEN I RETURN THE VEHICLE? Depending on the time the vehicle is to be returned there may not be a staff member present. Please speak to our friendly reception staff for instructions. Yes. Fuel is included in your cost. 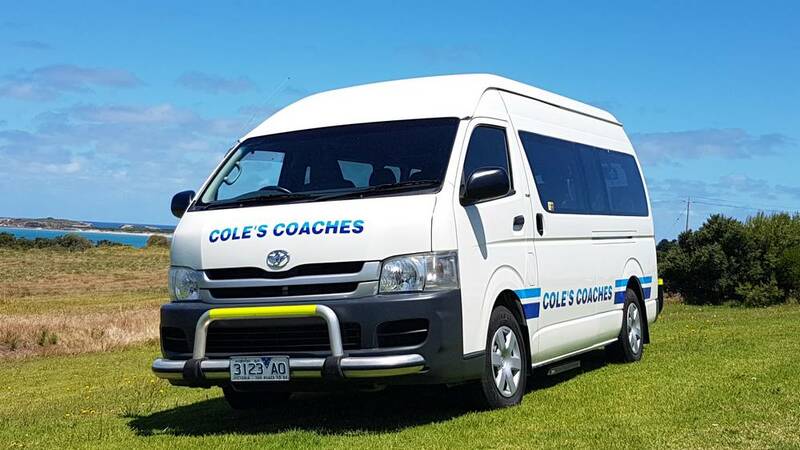 The hirer or driver is provided with a fuel card to charge any fuel needed to Cole’s Coaches. The driver must not consume alcohol. BYO laws on buses have changed. Please call our office for clarification. HOW MUCH LUGGAGE SPACE DO MINI-BUSES HAVE? The mini-buses have limited luggage space. If you have luggage we suggest you hire out a trailer with Cole’s Coaches. WHO PAYS FOR PARKING/CITYLINK OR SPEEDING FINES? The hirer is responsible for any fines incurred. Fines will be passed onto the hirer of the vehicle. WHAT HAPPENS IF THE VEHICLE HIRED HAS BEEN DAMAGED? All mini-buses are covered by third party insurance and have a $2000 excess in the event the vehicle is damaged. Speak to our staff about a cost to reduce the excess. If the hirer or driver has been negligent, under the influence of alcohol or drugs, or broken the law in any way, then all insurance cover is void. 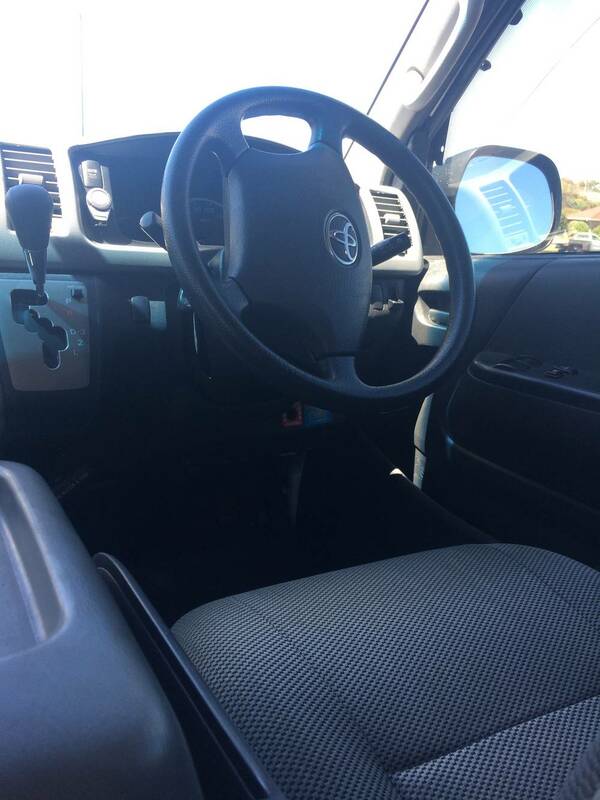 In this case the hirer/driver will be fully responsible for any associated costs. WHAT HAPPENS IF THE VEHICLE HAS A FLAT TYRE OR IS NOT FUNCTIONING PROPERLY? 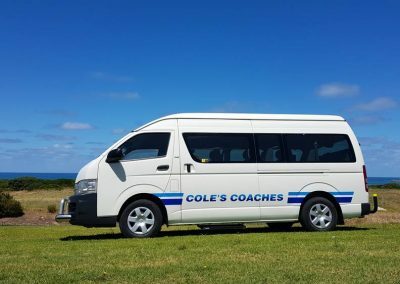 All Cole’s Coaches vehicles are fully maintained and accredited. However, occasionally vehicle breakdowns do occur. 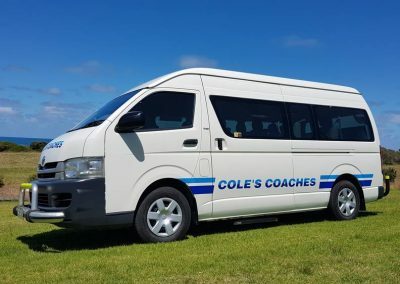 It is the hirer/driver’s responsibility to ensure that the vehicle is not at risk to any further damage and that Cole’s Coaches is contacted immediately. Each vehicle has a contact list for emergency breakdowns. WHO IS RESPOSIBLE FOR CLEANING THE VEHICLE? 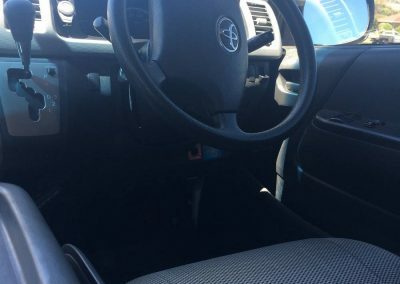 The cleaning of the vehicle is not required, however the vehicle must be returned in a reasonable condition. If the vehicle is not returned in a reasonable condition, a cleaning fee will be charged to the hirer. DOES THE DRIVER REQUIRE A WORK DIARY? If travelling more than 100kms from the vehicle collection point, the driver will need to use their Work Diary. Also if the driver has driven more than 100kms in the past 28 days, they will need to carry their work diary.